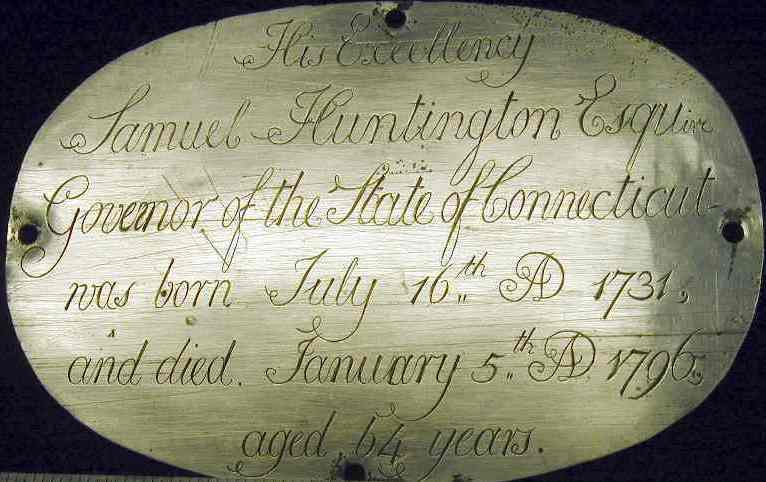 On September 28th, 1779 and again in 1780, the United States Continental Congress elected Samuel Huntington as its President. 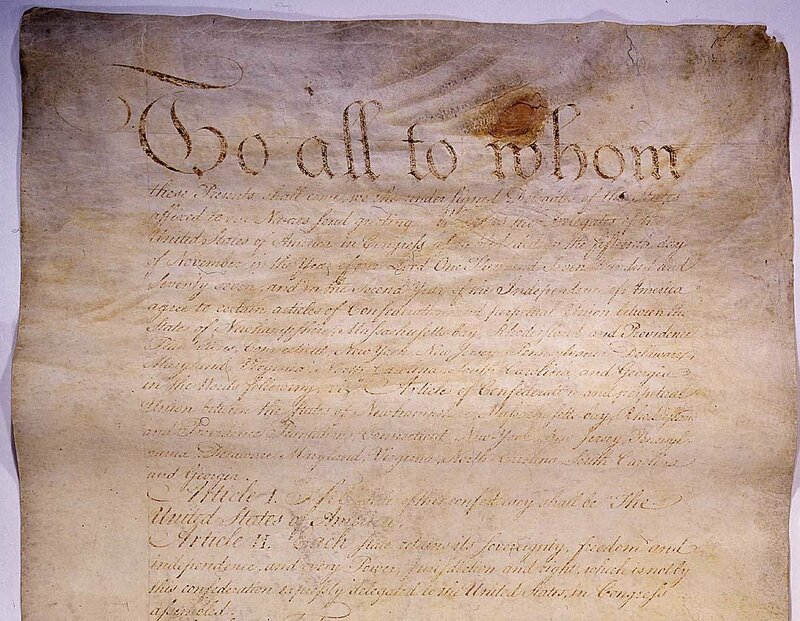 On February 22, 1781, with the Articles of Confederation unanimous ratified, it was resolved by Congress that the first United States Constitution commence on March 1, 1781. Samuel Huntington took the chair as first United States in Congress Assembled President, under the Articles of Confederation, on March 2, 1781. Both Martha and Samuel Huntington were re-interred on November 24, 2003 at Old Norwichtown Cemetery in Norwich, Connecticut. I was given the distinct privilege of delivering the keynote speech at the re-entombment of President and First Lady Huntington, an honor that was well above my station. Samuel Huntington's birthplace, the Huntington Homestead, is located at 36 Huntington Road in Scotland, Connecticut. The house and grounds are open to the public May through October on the first and third Saturdays of each month from 11 a.m. to 3 p.m.
President Huntington was a self-educated man who, at age sixteen, was apprenticed to a cooper. He taught himself Latin at night and devoured every book on law he could find. At twenty-seven he was admitted to the bar and relocated to Norwich, a larger town offering more opportunity to build a law practice. Within one year he met, courted and married Martha Devotion the local minister's daughter. The law practice and the couple flourished together in Norwich. In 1764, Huntington was elected to the provincial assembly and in quick succession became a justice of the peace, the King's Attorney for Connecticut, and a member of the colony's council. He was elected to the second Continental Congress of the United Colonies of America representing Connecticut in Philadelphia. His Excellency Samuel Huntington President is a Man of a Mild, Steady & firm Conduct and of Sound & Methodical Judgment though not a Man of Many Words or very Shining abilities. But upon the Whole is better Suited to Preside than any other Member Now in Congress. In his Dress & Manners, he is very plain, very gentlemanly and truly republican. He is from Connecticut. 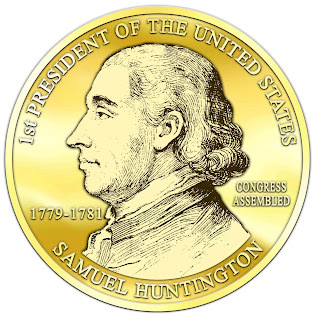 Samuel Huntington was elected President of the Continental Congress on September 28, 1779  as a replacement to John Jay, a staunch conservative, who sought and was granted the position of Foreign Minister to Spain. 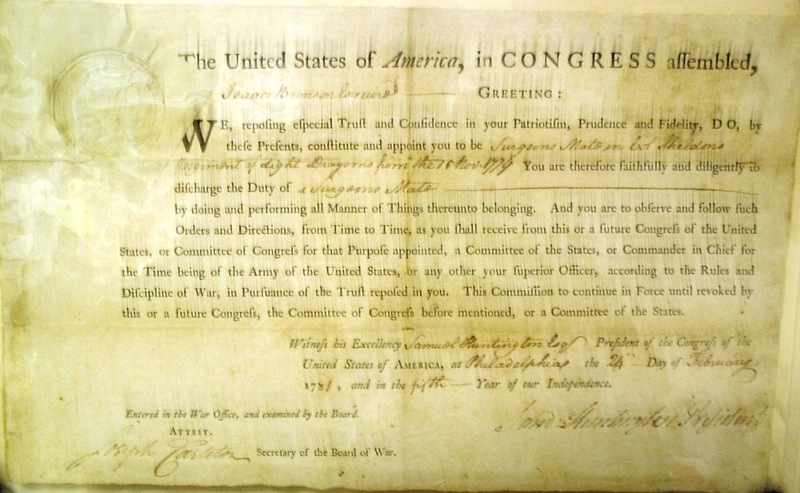 In a September 29, 1779 letter to New York Governor George Clinton former President John Jay approved of Huntington’s election clearly indicating that he did not alienate the Conservation Faction of Congress. Delegate Arthur Lee wrote to Elbridge Gerry a year later about Huntington’s Presidency that, “Toryism is triumphant here. They have displaced every Whig but the President”. By 1780, the son of a Connecticut farmer made the extraordinary transformation from a small town country lawyer to a quite effective U.S. Continental Congress President. Huntington presided over the Continental Congress during a critical period in the War for Independence. His commitment to independence and his Presidency is well-known among scholars as his unwavering leadership held our nation together during the following succession of military losses, sedition and unprecedented military defection. To His Excellency, Benjamin Franklin. Honoured and Dear Sir: When I had the honour of writing to you on the 11th of August, previous to my departure from the Road of Groaix, I had before me the most flattering prospect of rendering essential service to the common cause of France and America. I had a full confidence in the voluntary inclination and ability of every captain under my command to assist and support me in my duty with cheerful emulation; and I was persuaded that every one of them would pursue glory in preference to interest. Whether I was or was not deceived will best appear by a relation of circumstances. The little squadron under my orders, consisting of the Bonhomme Richard of 40 guns, the Alliance of 36 guns, the Pallas of 32 guns, the Cerf of 18 guns, and the Vengeance of 12 guns, joined by two privateers, the Monsieur and the Granville, sailed from the Road of Groaix at daybreak on the 14th of August; the same day we spoke with a large convoy bound from the southward to Brest. On the 18th we retook a large ship belonging to Holland, laden chiefly with brandy and wine that had been destined from Barcelona for Dunkirk, and taken eight days before by an English privateer. The captain of the Monsieur, however, took out of this prize such articles as he pleased in the night, and the next day being astern of the squadron and to windward, he actually wrote orders in his proper name, and sent away the prize under one of his own officers. This, however, I superseded by sending her for L'Orient under my orders in the character of commander-in-chief. The evening of the day following the Monsieur separated from the squadron. On the 20th we saw and chased a large ship, but could not overtake her, she being to windward. On the 21st we saw and chased another ship that was also to windward, and thereby eluded our pursuit. The same afternoon we took a brigantine called the Mayflower, laden with butter and salt provisions, bound from Limerick, in Ireland, for London; this vessel I immediately expedited for L'Orient. On the 23d we saw Cape Clear and S. W. part of Ireland. That afternoon, it being calm, I sent some armed boats to take a brigantine that appeared in the N. W. quarter. Soon after in the evening it became necessary to have a boat ahead of the ship to tow, as the helm could not prevent her from laying across the tide of flood, which would have driven us into a deep and dangerous bay, situated between the rocks on the south called the Shallocks, and on the north called the Blaskets. The ship's boats being absent, I sent my own barge ahead to tow the ship. The boats took the brigantine, she was called the Fortune, and bound with a cargo of oil, blubber, and staves, from Newfoundland for Bristol; this vessel I ordered to proceed immediately for Nantes or St. Malo. Soon after sunset the villains who towed the ship, cut the tow rope and decamped with my barge. Sundry shots were fired to bring them to without effect; in the mean time the master of the Bonhomme Richard, without orders, manned one of the ship's boats, and with four soldiers pursued the barge in order to stop the deserters. The evening was clear and serene, but the zeal of that officer, Mr. Cutting Lent, induced him to pursue too far, and a fog which came on soon afterwards prevented the boats from rejoining the ship, although I caused signal guns to be frequently fired. The fog and calm continued the next day till towards evening. In the afternoon Captain Landais came on board the Bonhomme Richard and behaved towards me with great disrespect, affirming in the most indelicate manner and language that I had lost my boats and people through my imprudence in sending boats to take a prize! He persisted in his reproaches, though he was assured by Messrs. de Weibert and de Chamillard that the barge was towing the ship at the time of elopement, and that she had not been sent in pursuit of the prize. He was affronted because I would not the day before suffer him to chase without my orders, and to approach the dangerous shore I have already mentioned, where he was an entire stranger, and when there was not sufficient wind to govern a ship. He told me he was the only American in the squadron, and was determined to follow his own opinion in chasing when and where he thought proper, and in every other matter that concerned the service, and that, if I continued in that situation three days longer, the squadron would be taken, etc. By the advice of Captain de Cottineau, and with the free consent and approbation of M. de Varage, I sent the Cerf in to reconnoitre the coast, and endeavour to take the boats and people the next day, while the squadron stood off and on in S. W. quarter, in the best possible situation to intercept the enemy's merchant ships, whether outward or homeward bound. The Cerf had on board a pilot well acquainted with the coast, and was ordered to join me again before night. I approached the shore in the afternoon, but the Cerf did not appear; this induced me to stand off again in the night in order to return and be joined by the Cerf the next day; but to my great concern and disappointment, though I ranged the coast along, and hoisted our private signals, neither the boats nor the Cerf joined me. The evening of that day, the 26th, brought with it stormy weather, with the appearance of a severe gale from the S. W., yet I must declare I did not follow my own judgment, but was led by the assertion which had fallen from Captain Landais, when I in the evening made a signal to steer to the northward and leave that station, which I wished to have occupied at least a week longer. The gale increased in the night with thick weather; to prevent separation, I carried a top light and fired a gun every quarter of an hour. I carried also a very moderate sail, and the course had been clearly pointed out by a signal before night; yet, with all this precaution, I found myself accompanied only by the brigantine Vengeance in the morning, the Granville having remained astern with a prize, as I have since understood the tiller of the Pallas broke after midnight, which disabled her from keeping up, but no apology has yet been made in behalf of the Alliance. On the 31st we saw the Flannen Islands, situated near the Lewis, on the N. W. coast of Scotland; and the next morning, off Cape Wrath, we gave chase to a ship to windward, at the same time two ships appearing in the N. W. quarter, which proved to be the Alliance and a prize ship which she had taken, bound, as I understood, from Liverpool to Jamaica. The ship which I chased brought to at noon; she proved to be the Union, letter of marque, bound from London for Quebec, with a cargo of naval stores on account of government, adapted for the service of British armed vessels on the lakes. The public despatches were lost, as the Alliance very imprudently hoisted American colours, though English colours were then flying on board the Bonhomme Richard. Captain Landais sent a small boat to ask whether I would man the ship, or he should, as in the latter case he would suffer no boat nor person from the Bonhomme Richard to go near the prize. Ridiculous as this appeared to me, I yielded to it for the sake of peace, and received the prisoners on board the Bonhomme Richard, while the prize was manned from the Alliance. In the afternoon another sail appeared, and I immediately made the signal for the Alliance to chase; but, instead of obeying, he wore and laid the ship's head the other way. The next morning I made a signal to speak with the Alliance, to which no attention was shown; I then made sail with the ships in company for the second rendezvous which was not far distant, and where I fully expected to be joined by the Pallas and Cerf. The 2d of September we saw a sail at daybreak, and gave chase; that ship proved to be the Pallas, and had met with no success while separated from the Bonhomme Richard. On the 3d the Vengeance brought to a small Irish brigantine, bound homeward from Norway. The same evening I sent the Vengeance in the N. E. quarter to bring up the two prize ships that appeared to me to be too near the islands of Shetland, while with the Alliance and Pallas I endeavoured to weather Fair Isle, and to get into my second rendezvous, where I directed the Vengeance to join me with the three prizes. The next morning, having weathered Fair Isle, and not seeing the Vengeance nor the prizes, I spoke the Alliance, and ordered her to steer to the northward and bring them up to the rendezvous. On the morning of the 4th the Alliance appeared again, and had brought to two very small coasting sloops in ballast, but without having attended properly to my orders of yesterday. The Vengeance joined me soon after, and informed me that in consequence of Captain Landais' orders to the commanders of the two prize ships, they had refused to follow him to the rendezvous. I am to this moment ignorant of what orders these men received from Captain Landais, nor know I by virtue of what authority he ventured to give his orders to prizes in my presence, and without either my knowledge or approbation. Captain Ricot further informed me that he had burnt the prize brigantine, because that vessel proved leaky; and I was sorry to understand afterward that though the vessel was Irish property, the cargo was property of the subjects of Norway. In the evening I sent for all the captains to come on board the Bonhomme Richard, to consult on future plans of operations. Captains Cottineau and Ricot obeyed me, but Captain Landais obstinately refused, and after sending me various uncivil messages, wrote me a very extraordinary letter in answer to a written order which I had sent him, on finding that he had trifled with my verbal orders. The next day a pilot boat came on board from Shetland, by which means I received such advices as induced me to change a plan which I otherwise meant to have pursued; and as the Cerf did not appear at my second rendezvous, I determined to steer towards the third in hopes of meeting her there. In the afternoon a gale of wind came on, which continued four days without intermission. In the second night of that gale the Alliance, with her two little prizes, again separated from the Bonhomme Richard. I had now with me only the Pallas and the Vengeance, yet I did not abandon the hopes of performing some essential service. The winds continued contrary, so that we did not see the land till the evening of the 13th, when the hills of the Cheviot in the S. E. of Scotland appeared. The next day we chased sundry vessels, and took a ship and a brigantine, both from the Firth of Edinburgh, laden with coal. Knowing that there lay at anchor in Leith Road an armed ship of 20 guns, with two or three fine cutters, I formed an expedition against Leith, which I purposed to lay under a large contribution, or otherwise to reduce it to ashes. Had I been alone, the wind being favourable, I would have proceeded directly up the Firth, and must have succeeded, as they lay there in a state of perfect indolence and security, which would have proved their ruin. Unfortunately for me, the Pallas and Vengeance were both at a considerable distance in the offing, they having chased to the southward; this obliged us to steer out of the Firth again to meet them. The captains of the Pallas and Vengeance being come on board the Bonhomme Richard, I communicated to them my project, to which many difficulties and objections were made by them; at last, however, they appeared to think better of the design, after I had assured them that I hoped to raise 200,000 pounds sterling on Leith, and that there was no battery of cannon there to oppose our landing. So much time, however, was unavoidably spent in pointed remarks and sage deliberation that night, that the wind became contrary in the morning. We continued working to windward up the Firth without being able to reach the road of Leith, till, on the morning of the 17th, when, being almost within cannon shot of the town, having everything in readiness for a descent, a very severe gale of wind came on, and being directly contrary, obliged us to bear away, after having in vain endeavoured for some time to withstand its violence. The gale was so severe that one of the prizes that had been taken on the 14th sunk to the bottom, the crew being with difficulty saved. As the alarm by this time had reached Leith by means of a cutter that had watched our motions that morning, and as the wind continued contrary (though more moderate in the evening), I thought it impossible to pursue the enterprize with a good prospect of success; especially as Edinburgh, where there is always a number of troops, is only a mile distant from Leith, therefore I gave up the project. On the 19th, having taken a sloop and a brigantine in ballast, with a sloop laden with building timber, I proposed another project to M. Cottineau, which would have been highly honourable though not profitable; many difficulties were made, and our situation was represented as being the most perilous. The enemy, he said, would send against us a superior force, and that if I obstinately continued on the coast of England two days longer, we should all be taken. The Vengeance having chased along shore to the southward, Captain Cottineau said he would follow her with the prizes, as I was unable to make much sail, having that day been obliged to strike the main-top-mast to repair damages; and as I afterward understood, he told M. de Chamillard that unless I joined them the next day, both the Pallas and the Vengeance would leave that coast. I had thoughts of attempting the enterprize alone after the Pallas had made sail to join the Vengeance. I am persuaded, even now, that I would have succeeded, and to the honour of my young officers, I found them as ardently disposed to the business as I could desire; nothing prevented me from pursuing my design but the reproach that would have been cast upon my character, as a man of prudence, had the enterprize miscarried. It would have been said, was he not forewarned by Capt. Cottineau and others? I made sail along shore to the southward, and next morning took a coasting sloop, in ballast, which, with another that I had taken the night before, I ordered to be sunk. In the evening I again met with the Pallas and Vengeance, off Whitby. Captain Cottineau told me he had sunk the brigantine, and ransomed the sloop, laden with building timber, that had been taken the day before. I had told Captain Cottineau, the day before, that I had no authority to ransom prizes. On the 21st we saw and chased two sail, off Flamborough Head, the Pallas in the N. E. quarter, while the Bonhomme Richard followed by the Vengeance in the S. W. The one I chased, a brigantine collier in ballast, belonging to Scarborough, was soon taken, and sunk immediately afterward, as a fleet then appeared to the southward. It was so late in the day that I could not come up with the fleet before night; at length, however, I got so near one of them as to force her to run ashore, between Flamborough Head and the Spurn. Soon after I took another, a brigantine from Holland, belonging to Sunderland; and at daylight the next morning, seeing a fleet steering towards me from the Spurn, I imagined them to be a convoy, bound from London for Leith, which had been for some time expected; one of them had a pendant hoisted, and appeared to be a ship of force. They had not, however, courage to come on, but kept back, all except the one which seemed to be armed, and that one also kept to windward very near the land, and on the edge of dangerous shoals, where I could not with safety approach. This induced me to make a signal for a pilot, and soon afterward two pilot boats came off; they informed me that the ship that wore a pendant was an armed merchant ship, and that a king's frigate lay there in sight, at anchor within the Humber, waiting to take under convoy a number of merchant ships bound to the northward. The pilots imagined the Bonhomme Richard to be an English ship of war, and, consequently, communicated to me the private signal which they had been required to make. I endeavoured by this means to decoy the ships out of the port, but the wind then changing, and with the tide becoming unfavourable for them, the deception had not the desired effect, and they wisely put back. The entrance of the Humber is exceedingly difficult and dangerous, and, as the Pallas was not in sight, I thought it not prudent to remain off the entrance; I, therefore, steered out again to join the Pallas off Flamborough Head. In the night we saw and chased two ships until three o'clock in the morning, when, being at a very small distance from them, I made the private signal of recognizance, which I had given to each captain before I sailed from Groaix. One half of the answer only was returned. In this position both sides lay to till daylight, when the ships proved to be the Alliance and the Pallas. On the morning of that day, the 23d of September, the brig from Holland not being in sight, we chased a brigantine that appeared laying to windward. About noon we saw and chased a large ship that appeared coming round Flamborough Head, from the northward, and at the same time I manned and armed one of the pilot boats to sail in pursuit of the brigantine, which now appeared to be the vessel that I had forced ashore. Soon after this a fleet of forty-one sail appeared off Flamborough Head, bearing N. N. E.; this induced me to abandon the single ship which had then anchored in Burlington Bay; I also called back the pilot boat and hoisted a signal for a general chase. When the fleet discovered us bearing down all the merchant ships crowded sail towards the shore. The two ships of war that protected the fleet at the same time steered from the land, and made the disposition for the battle. In approaching the enemy I crowded every possible sail, and made the signal for the line of battle, to which the Alliance showed no attention. Earnest as I was for the action, I could not reach the commodore's ship until seven in the evening, being then within pistol shot, when he hailed the Bonhomme Richard. We answered him by firing a whole broadside. The battle being thus begun, was continued with unremitting fury. Every method was practised on both sides to gain an advantage, and rake each other; and I must confess that the enemy's ship being much more manageable than the Bonhomme Richard, gained thereby several times an advantageous situation, in spite of my best endeavours to prevent it. As I had to deal with an enemy of greatly superior force, I was under the necessity of closing with him, to prevent the advantage which he had over me in point of manœuvre. It was my intention to lay the Bonhomme Richard athwart the enemy's bow, but as that operation required great dexterity in the management of both sails and helm, and some of our braces being shot away, it did not exactly succeed to my wishes; the enemy's bowsprit, however, came over the Bonhomme Richard's poop, by the mizzen mast, and I made both ships fast together in that situation, which, by the action of the wind on the enemy's sails, forced her stern close to the Bonhomme Richard's bow, so that the ships lay square alongside of each other, the yards being all entangled, and the cannon of each ship touching the opponent's side. When this position took place it was eight o'clock, previous to which the Bonhomme Richard had received sundry eighteen pound shot below the water and leaked very much. My battery of 12-pounders, on which I had placed my chief dependence, being commanded by Lieut. Dale and Col. Weibert, and manned principally with American seamen and French volunteers, were entirely silenced and abandoned. As to the six old 18-pounders that formed the battery of the lower gun-deck, they did no service whatever; two out of three of them burst at the first fire, and killed almost all the men who were stationed to manage them. Before this time, too, Col. de Chamillard, who commanded a party of twenty soldiers on the poop, had abandoned that station, after having lost some of his men. These men deserted their quarters. I had now only two pieces of cannon, 9-pounders, on the quarter-deck that were not silenced, and not one of the heavier cannon was fired during the rest of the action. The purser, Mr. Mease, who commanded the guns on the quarter-deck, being dangerously wounded in the head, I was obliged to fill his place, and with great difficulty rallied a few men, and shifted over one of the lee quarter-deck guns, so that we afterwards played three pieces of 9-pounders upon the enemy. The tops alone seconded the fire of this little battery, and held out bravely during the whole of the action; especially the main top, where Lieut. Stack commanded. I directed the fire of one of the three cannon against the main-mast with double-headed shot, while the other two were exceedingly well served with grape and canister-shot to silence the enemy's musketry, and clear her decks, which was at last effected. The enemy were, as I have since understood, on the instant of calling for quarter, when the cowardice or treachery of three of my under officers induced them to call to the enemy. The English commodore asked me if I demanded quarter, and I having answered him in the most determined negative, they renewed the battle with double fury; they were unable to stand the deck, but the fire of their cannon, especially the lower battery, which was entirely formed of 18-pounders, was incessant. Both ships were set on fire in various places, and the scene was dreadful beyond the reach of language. To account for the timidity of my three under officers, I mean the gunner, the carpenter, and the master-at-arms, I must observe that the two first were slightly wounded, and as the ship had received various shots under water, and one of the pumps being shot away, the carpenter expressed his fear that she would sink, and the other two concluded that she was sinking, which occasioned the gunner to run aft on the poop, without my knowledge, to strike the colours; fortunately for me, a cannon ball had done that before, by carrying away the ensign staff; he was, therefore, reduced to the necessity of sinking, as he supposed, or of calling for quarter, and he preferred the latter. All this time the Bonhomme Richard had sustained the action alone, and the enemy, though much superior in force, would have been very glad to have got clear, as appeared by their own acknowledgments, and their having let go an anchor the instant I laid them on board, by which means they would have escaped, had I not made them well fast to the Bonhomme Richard. At last, at half-past nine o'clock, the Alliance appeared, and I now thought the battle at an end; but to my utter astonishment, he discharged a broadside full into the stern of the Bonhomme Richard. We called to him for God's sake to forbear firing into the Bonhomme Richard; yet he passed along the off side of the ship, and continued firing. There was no possibility of his mistaking the enemy's ship for the Bonhomme Richard, there being the most essential difference in their appearance and construction; besides it was then full moonlight, and the sides of the Bonhomme Richard were all black, while the sides of the prizes were yellow; yet, for their greater security, I showed the signal of our reconnoissance by putting out three lanterns, one at the head (bow), another at the stern (quarter), and the third in the middle, in a horizontal line. Every tongue cried that he was firing into the wrong ship, but nothing availed, he passed round, firing into the Bonhomme Richard's head, stern, and broadside, and by one of his volleys killed several of my best men and mortally wounded a good officer on the forecastle. My situation was really deplorable. The Bonhomme Richard received various shots under water from the Alliance; the leak gained on the pumps; and the fire increased much on board both ships. Some officers persuaded me to strike, of whose courage and good sense I entertain a high opinion. My treacherous master-at-arms let loose all my prisoners, without my knowledge, and my prospect became gloomy indeed. I would not, however, give up the point. The enemy's main-mast began to shake, their firing decreased, ours rather increased, and the British colours were struck at half an hour past ten o'clock. This prize proved to be the British ship-of-war the Serapis, a new ship of 44 guns, built on their most approved construction, with two complete batteries, one of them 18-pounders, and commanded by the brave Commodore Richard Pearson. I had yet two enemies to encounter far more formidable than the Britons—I mean fire, and water. The Serapis was attacked only by the first, but the Bonhomme Richard was assailed by both: there were five feet water in the hold, and though it was moderate from the explosion of so much gunpowder, yet the three pumps that remained could with difficulty only keep the water from gaining. The fire broke out in various parts of the ship, in spite of all the water that could be thrown to quench it, and at length broke out as low as the powder magazine, and within a few inches of the powder. In that dilemma, I took out the powder upon deck, ready to be thrown overboard at the last extremity, and it was 10 o'clock the next day, the 24th, before the fire was entirely extinguished. With respect to the situation of the Bonhomme Richard, the rudder was cut entirely off the stern frame, and the transoms were almost entirely cut away; the timbers, by the lower deck especially, from the mainmast to the stern, being greatly decayed with age, were mangled beyond my power of description; and a person must have been an eye witness to form a just idea of the tremendous scene of carnage, wreck, and ruin that everywhere appeared. Humanity cannot but recoil from the prospect of such finished horror, and lament that war should produce such fatal consequences. After the carpenters, as well as Capt. de Cottineau, and other men of sense had well examined and surveyed the ship (which was not finished before five in the evening), I found every person to be convinced that it was impossible to keep the Bonhomme Richard afloat so as to reach a port if the wind should increase, it being then only a very moderate breeze. I had but little time to remove my wounded, which now became unavoidable, and which was effected in the course of the night and next morning. I was determined to keep the Bonhomme Richard afloat, and, if possible, to bring her into port. For that purpose, the first lieutenant of the Pallas continued on board with a party of men to attend the pumps, with boats in waiting, ready to take them on board, in case the water should gain on them too fast. The wind augmented in the night and the next day, on the 25th, so that it was impossible to prevent the good old ship from sinking. They did not abandon her until after 9 o'clock; the water was then up to the lower deck, and a little after ten, I saw with inexpressible grief the last glimpse of the Bonhomme Richard. No lives were lost with the ship, but it was impossible to save the stores of any sort whatever. I lost even the best part of my clothes, books, and papers; and several of my officers lost all their clothes and effects. Having thus endeavoured to give a clear and simple relation of the circumstances and events that have attended the little armament under my command, I shall freely submit my conduct therein to the censure of my superiors and the impartial public. I beg leave, however, to observe, that the force that was put under my command was far from being well composed; and as the great majority of the actors in it have appeared bent on the pursuit of interest only, I am exceedingly sorry that they and I have been at all concerned. I am in the highest degree sensible of the singular attentions which I have experienced from the court of France, which I shall remember with perfect gratitude until the end of my life, and will always endeavour to merit, while I can, consistent with my honour, continue in the public service. I must speak plainly. As I have always been honoured with the full confidence of Congress, and as I always flattered myself with enjoying in some measure the confidence of the court of France, I could not but be astonished at the conduct of M. de Chaumont, when, in the moment of my departure from Groaix, he produced a paper, a concordat, for me to sign, in common with the officers whom I had commissioned but a few days before. Had that paper, or even a less dishonourable one, been proposed to me at the beginning, I would have rejected it with just contempt, and the word déplacement, among others, should have been necessary. I cannot, however, even now suppose that he was authorized by the court to make such a bargain with me; nor can I suppose that the minister of marine meant that M. de Chaumont should consider me merely as a colleague with the commanders of the other ships, and communicate to them not only all he knew, but all he thought, respecting our destination and operations. M. de Chaumont has made me various reproaches on account of the expense of the Bonhomme Richard, wherewith I cannot think I have been justly chargeable. M. de Chamillard can attest that the Bonhomme Richard was at last far from being well fitted or armed for war. If any person or persons who have been charged with the expense of that armament have acted wrong, the fault must not be laid to my charge. I had no authority to superintend that armament, and the persons who had authority were so far from giving me what I thought necessary that M. de Chaumont even refused, among other things, to allow me irons to secure the prisoners of war. In short, while my life remains, if I have any capacity to render good and acceptable services to the common cause, no man will step forward with greater cheerfulness and alacrity than myself, but I am not made to be dishonoured, nor can I accept of the half confidence of any man living; of course, I cannot, consistent with my honour and a prospect of success, undertake future expeditions, unless when the object and destination is communicated to me alone, and to no other person in the marine line. In cases where troops are embarked, a like confidence is due alone to their commander-in-chief. On no other condition will I ever undertake the chief command of a private expedition; and when I do not command in chief, I have no desire to be in the secret. Captain Cottineau engaged the Countess of Scarborough, and took her after an hour's action, while the Bonhomme Richard engaged the Serapis. The Countess of Scarborough is an armed ship of 20 six-pounders, and was commanded by a king's officer. In the action, the Countess of Scarborough and the Serapis were at a considerable distance asunder; and the Alliance, as I am informed, fired into the Pallas, and killed some men. If it should be asked why the convoy was suffered to escape, I must answer, that I was myself in no condition to pursue, and that none of the rest showed any inclination, not even M. Ricot, who had held off at a distance to windward during the whole action, and withheld by force the pilot boat with my lieutenant and 15 men. The Alliance, too, was in a state to pursue the fleet, not having had a single man wounded, or a single shot fired at her from the Serapis, and only three that did execution from the Countess of Scarborough, at such a distance that one stuck in the side, and the other two just touched and then dropped into the water. The Alliance killed one man only on board the Serapis. As Captain de Cottineau charged himself with manning and securing the prisoners of the Countess of Scarborough, I think the escape of the Baltic fleet cannot so well be charged to his account. I should have mentioned that the main-mast and mizzen topmast of the Serapis fell overboard soon after the captain had come on board the Bonhomme Richard. Upon the whole, the captain of the Alliance has behaved so very ill in every respect that I must complain loudly of his conduct. He pretends that he is authorized to act independent of my command. I have been taught the contrary; but, supposing it to be so, his conduct has been base and unpardonable. M. de Chamillard will explain the particulars. Either Captain Landais or myself is highly criminal, and one or the other must be punished. I forbear to take any steps with him until I have the advice and approbation of Your Excellency. I have been advised by all the officers of the squadron to put M. Landais under arrest; but, as I have postponed it so long, I will bear with him a little longer, until the return of my express. We this day anchored here, having since the action been tossed to and fro by contrary winds. I wished to have gained the road of Dunkirk on account of our prisoners, but was overruled by the majority of my colleagues. I shall hasten up to Amsterdam, and there, if I meet with no orders from my government, I will take the advice of the French ambassador. It is my present intention to have the Countess of Scarborough ready to transport the prisoners from hence to Dunkirk, unless it should be found more expedient to deliver them to the English ambassador, taking his obligation to send to Dunkirk, &c., immediately an equal number of American prisoners. I am under strong apprehensions that our object here will fail, and that through the imprudence of M. de Chaumont, who has communicated everything he knew or thought on the matter to persons who cannot help talking of it at a full table. This is the way he keeps state secrets, though he never mentioned the affair to me. 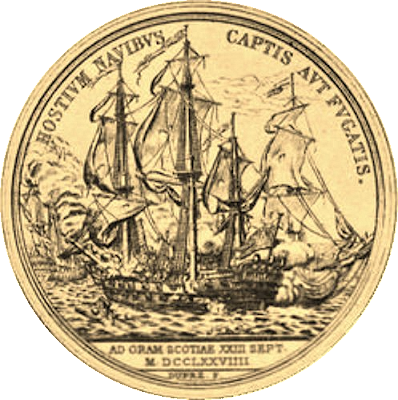 CAPTAIN JOHN PAUL JONES GOLD MEDAL, Capture of the Serapis - JOANNI PAVLO JONES CLASSIS PRÆFECTO. COMITIA AMERICANA. (The American Congress to naval commander John Paul Jones). Bust of Captain Jones, in uniform, facing the right. On edge of bust, dupré fecit. HOSTIVM NAVIBVS CAPTIS AVT FVGATIS. (The enemy's vessels taken or put to flight) Naval action between the United States frigate Bonhomme Richard, of forty guns, Captain John Paul Jones, and the British frigate Serapis, of forty-four guns, Captain Pearson. Both vessels are grappled, lying head and stern. The Bonhomme Richard is on fire, and her crew are boarding the Serapis. To the left, a third vessel.Exergue: AD ORAM SCOTIÆ (sic) XXIII SEPT. (Septembris) M.DCCLXXVIIII. (Off the coast of Scotland, September 23, 1779.) dupré. fecit. The bust of John Paul Jones, on the obverse of this medal, is from a plaster cast by Houdon, the celebrated sculptor. 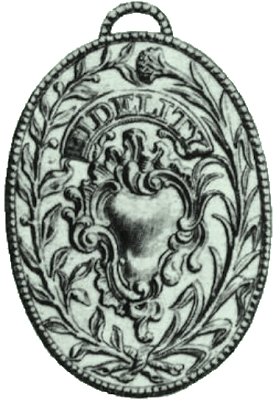 The legend on the reverse of the medal is the second of the two proposed by the French Academy of Inscriptions and Belles-Lettres. The first was, primus americanorum triumphus navalis. The Chevalier John Paul Jones was born at Arbingland, in the parish of Kirkbean, in Scotland, July 6, 1747. He went to sea when young, and settled in Virginia in 1773. 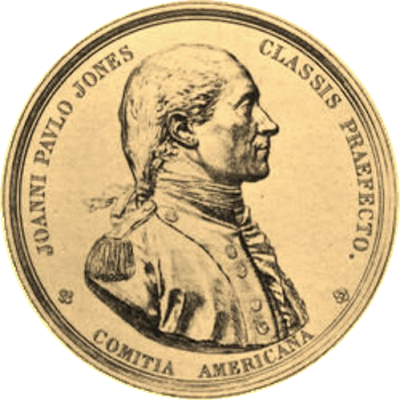 In 1775 he was appointed a lieutenant in the navy, through the recommendation of General Jones, of North Carolina, and in gratitude to him, he added the name of Jones to his family name of Paul. He joined the Alfred, of thirty guns and three hundred men, and on her deck, October 10, 1776, when off Chestnut street wharf, Philadelphia, under a salute of thirteen guns, hoisted with his own hands the first American naval flag. This had thirteen stripes, but without the blue union, and bore across the field a rattlesnake with the motto "Don't tread on me." Appointed captain in October, 1776, he was soon afterward sent by Congress to France, to arrange certain naval matters with the American commissioners. Subsequently he carried terror along the coast of England, and on September 23, 1779, fought his famous action off Flamborough Head, near Scarborough, in which he took the Serapis, Captain Richard Pearson. He was enthusiastically received in France, and King Louis XVI. presented him with a sword of honor and with the cross of Military Merit. Congress gave him a vote of thanks and a gold medal, in 1787, and sent him to France, Denmark, and Sweden, as agent for prize money. The same year he entered the Russian service with the rank of rear-admiral, and received from the Empress Catherine II. the cross of St. Anne. He had a command in the squadron stationed in the Black Sea, where he greatly distinguished himself, but embittered by slanderous calumnies, he left the Russian service and settled in Paris, where he died in poverty, July 18, 1792. The National Assembly of France, then in session, expressed their regret for him by wearing mourning, and sent a deputation to attend his funeral. And the mock troops disband for want of pay. The Presidency placed social obligations on the President and his wife Martha who had joined him in Philadelphia. They were frequently entertaining members of Congress and were being entertained at afternoon dinners and tea. As the ranking member of the Continental Congress, this Head of State was present at events ranging from 4th of July celebrations to state hospitality functions for foreign visiting dignitaries. In early 1780, however, it became clear that the fortunes of the Americans, instead of improving, had grown worse to the point of desperation. France’s aid began to wane due to states' failure to ratify the Constitution of 1777 and meet monetary military and troop quotas. American money wasn't worth a “Continental” and credit abroad hung on the dwindling fortunes and talents of patriots like Robert Morris and Haym Salomon. Legally, the nation that sought foreign recognition and aid was not united at all. The army, clothed in rags, half-starved and not paid, was ripe for mutiny; desertions to the British lines averaged more than 100 a month. The British launched a southern spring campaign and successfully captured the key southern ports. Even former Continental Congress President Henry Middleton surrendered with the fall of Charleston, South Carolina taking an oath of allegiance to King George III. George Washington wrote during this period "he had almost ceased to hope." 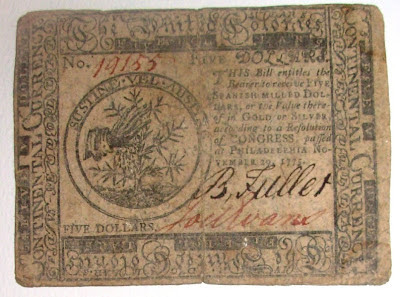 Nothing plagued the Continental Congress more than the devaluation of its currency. 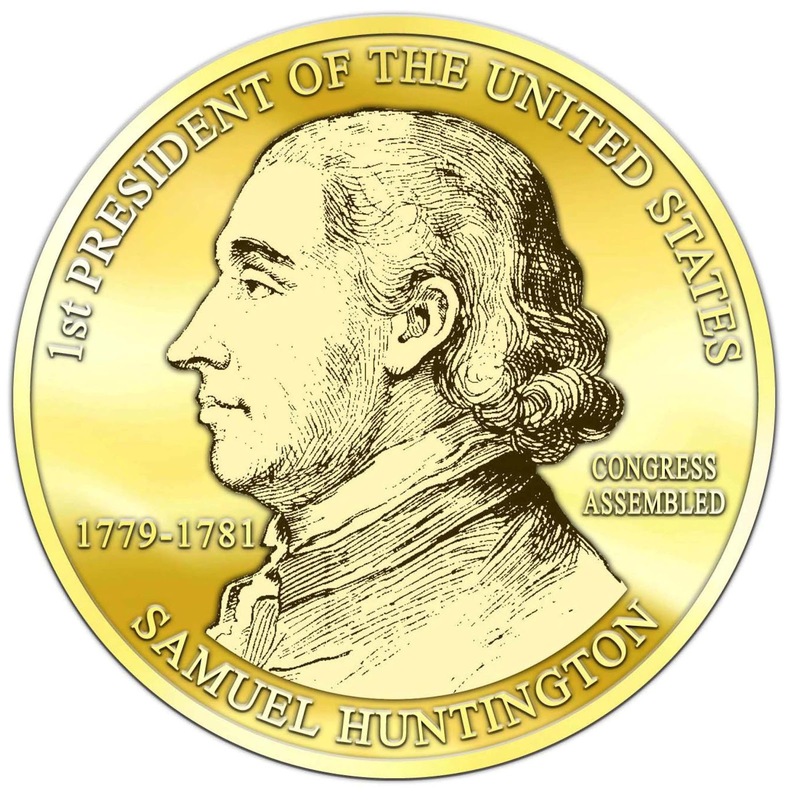 President Huntington insisted that the only solution to the United States financial ills of debt amounting to 200 million dollars was “fixing a standard for the currency.” By March 1780, Congress was faced with the dollar devaluing to new lows that in some sections of the nation were at $50 U.S. Continental dollars for on Spanish silver dollar. The following table represents the official marks of the U.S. Dollar depreciation from May 1775 to March 18, 1780. 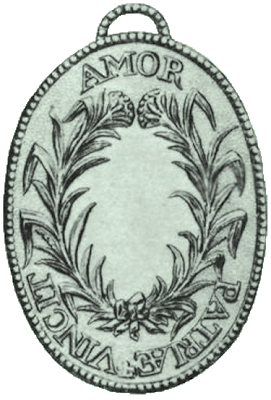 On March 18, 1780, with the enactment of a resolution, the Continental Congress reneged on its 1775 currency face guarantee of exchanging 1 U.S. dollar for 1 Spanish Milled dollar hyper-inflating repayment to 40 U.S. Dollars for 1 Spanish Milled Dollar. The U.S. by the stroke of a pen effectively reduced the national debt they owed in Spanish Milled dollars from $200,000,000 to $5,000,000 with the enactment of the March 18, 1780 resolution. The President’s Connecticut delegation, that included Roger Sherman and Oliver Ellsworth, voted unanimously for the resolution believing that the new currency policy would result in the stabilization of the national economy. It was on March 31, 1780 that Huntington presided over another challenge to the war effort, the court-marshal of General Benedict Arnold known as the “Charming Nancy Affair.” Arnold, with some Philadelphia businessmen, invested in a schooner called the Nancy. The schooner, laden with supplies, was captured by New Jersey privateers and forced to dock in Egg Harbor, New Jersey. The military commander fearful of losing the supplies had sent twelve wagons belonging to the state of Pennsylvania on an eight day trip to get a cargo of goods from the schooner. The Executive Council of Pennsylvania headed by Joseph Reed who as Washington’s aid conspired to remove him from the Commander-in-Chief, was keeping meticulous records of any complaints lodged on Arnold since his appointment as Philadelphia’s Military Commander. Upon learning of the Arnold’s Schooner’s “war profiteering,” the Executive Council brought formal charges before Congress against Military Commander. Samuel Huntington was forced to take off his legislative hat and act as "Chief Justice" presiding over the hearing, with the entire Congress as fellow justices that took almost the entire day. The verdict was an acquittal on six charges but he was found guilty on illegally permitting ships to dock in Philadelphia and using the Executive Councils’ wagons to transport his partnership's cargo from Egg Harbor to Philadelphia of the eight counts. George Washington, who had great respect for Arnold's field accomplishments, tenacity, and courage, issued only a gentle reprimand. It was shortly after this that the very disgruntled Benedict Arnold sought the command of West Point through his friend General Philip John Schuyler who believed the patriot deserved an important military post outside of Philadelphia in the face of the conviction. Both Schuyler and NY Delegate Livingston lobbied Huntington, the Commander-in-Chief and in August Washington approved the command with the backing of Congress. The stage was now set for a betrayal that is now legendary in American History. Benedict Arnold would use this post, granted to him by his most influential political and military benefactors including President Samuel Huntington and George Washington, as the means to betray the States and end the war in Great Britain's favor. In the summer of 1780, as the Commander of West Point, Arnold was now in a key position to deal a cancerous blow to the Continental Army. Stung by what he believed to be military injustices to his past commands and reputation, he was suitably recruited by British Spy Major John Andre and American loyalist, Beverley Robinson. Influenced by his surroundings of what he believed incompetence, Arnold was readily persuaded that the war was lost and lives were being needlessly wasted. It was his destiny, he now believed, to act out a part in the Revolutionary War similar to General Monk who was a key player in the restoration of Charles II to the British throne. Arnold believed the surrendering of West Point would cripple the efforts of Continental Army as it was a crucial trade and supply route to the Northeast. Together with Britain’s success in the southern campaign, the loss of West Point would force the Continental Congress to abandon their cause for Independence. On July 15, 1780 General Arnold asked for 20,000 pounds and a commission as brigadier-general in return for successfully ceding West Point to Britain. Arnold wrote to British General Clinton, "A personal interview with an officer that you can confide in is absolutely necessary to plan matters." The officer Arnold requested was John Andre and the arrangement was accepted. Arnold began to devise plans to turn over West Point and provide the British with valuable military intelligence. Robinson's House in the Highlands, September 26, 1780. Sir: I have the honor to inform Congress that I arrived here yesterday about 12 o'clock on my return from Hartford. Some hours previous to my arrival Major General Arnold went from his quarters which were at this place; and as it was supposed over the river to the garrison at West-point, whether I proceeded myself in order to visit the post. I found General Arnold had not been there during the day, and on my return to his quarters, he was still absent. In the mean time a packet had arrived from Lt. Colonel Jamison announcing the capture of a John Anderson who was endeavoring to go to New York, with the several interesting and important papers mentioned below, all in the hand writing of General Arnold. This was also accompanied with a letter from the prisoner avowing himself to be Major John André Adjt: General of the British army, relating the manner of his capture, and endeavoring to show that he did not come under the description of a spy. From these several circumstances, and information that the General seemed to be thrown into some degree of agitation on receiving a letter a little time before he went from his quarters, I was led to conclude immediately that he had heard of Major André's captivity, and that he would if possible escape to the enemy, and accordingly took such measures as appeared the most probable to apprehend him. But he had embarked in a barge, and proceeded down the river under a flag to the vulture ship of war, which lay at some miles below Stony and Verplank's points. He wrote me after he got on board a letter, of which the inclosed is a copy. Major André is not arrived yet, but I hope he is secure and that he will be here today. I have been and am taking proper precautions, which I trust will prove effectual, to prevent the important consequences which this conduct on the part of General Arnold was intended to produce. I do not know the party that took Major André; but it is said, it consisted only of a few militia, who acted in such a manner upon the occasion as does them the highest honor and proves them to be men of great virtue. They were offered, I am informed, a large sum of money for his release, and as many goods as they would demand, but without any effect. Their conduct gives them a just claim to the thanks of their country, and I also hope they will be otherwise rewarded. As soon as I know their names I shall take pleasure in transmitting them to Congress. I have taken such measures with respect to the Gentlemen of General Arnolds family as prudence dictated; but from everything that has hitherto come to my knowledge, I have the greatest reason to believe they are perfectly innocent. I early secured, Joshua Smith, the person mentioned in the close of General Arnolds. The President having informed Congress that one year was elapsed since his election, Resolved, That no rule or practice of the house limits the term for which the President is elected. On the question to agree to this, the yeas and nays being required by Mr. [John] Mathews, So it was resolved in the affirmative. Resolved, That the continuance of the President in office shall not be longer than one year from this day, and that all future elections shall be agreeable to the rule marked out by the Confederation. I think of all the men of ambition I have ever met with in the course of my peregrinations (which have not been confined within a very narrow compass) S.H. bears away the prize in triumph. So far from his manifesting the least disposition to quit, he seemed to be highly pleased with the opinions of his [you may fill the space as you please] "that he had a right to set there for life. " This is true Republican doctrine. Ay! you may laugh, or get into a passion about it-but I tell you it must be so, because the Greatest Republican in America said so. Damnation seize such Sycophants! Who will sell their consciences to the Devil for the sake of carrying a favorite point? After four hours hard struggle, all we could obtain was, that all future Presidents, should be for elected for one year only, but maugre every exertion, they obtruded their favorite upon us for another year. Could Old Randolph have risen from the Dead, & been in the chair, I wou'd have opposed his continuance, with the same activity & spirit, I did the present person, on the principles of true Republicanism, more especially when I so evidently saw, an elevated station had made a man forget himself, who from being a very modest one, had so strongly imbibed the sweets of power, as to become a very conceited, & ambitious one. Did the man possess abilities for the station, I could have acquiesced with a tolerable degree of content, but when I know he possesses no one requisite for it, I must confess my feelings are egregiously hurt. I think, had almost any other man been in his situation, when he found how extremely disagreeable his continuance in office was, to a number of members, he would have made it a point to have had a new election, & taken his chance, but he verified the Old proverb "A bird in the hand is worth two in the bush." General Washington to Samuel Huntington, President of Congress. Robinson House, In The Highlands, September 26, 1780. To: The President Of Congress. In the mean time, a packet had arrived from Lieutenant-Colonel Jameson, announcing the capture of a John Anderson, who was endeavouring to go to New York with several interesting and important papers, all in the handwriting of General Arnold. This was also accompanied with a letter from the prisoner, avowing himself to be Major John André, adjutant-general of the British army, relating the manner of his capture, and endeavouring to show that he did not come under the description of a spy. From the several circumstances, and information that the general (Arnold) seemed to be thrown into some degree of agitation on receiving a letter, a little time before he went down from his quarters, I was led to conclude immediately, that he had heard of Major André's captivity, and that he would, if possible, escape to the enemy; and I accordingly took such measures as appeared the most probable, to apprehend him. But he had embarked in a barge, and proceeded down the river under a flag to the Vulture sloop-of-war, which lay some miles below Stony and Verplanck's Points. After he got on board, he wrote to me a letter, of which the enclosed is a copy. Major André is not arrived yet, but I hope he is secure, and that he will be here to-day. I have been and am taking proper precautions, which I trust will prove effectual, to prevent the important consequences which this conduct on the part of General Arnold was intended to produce. I do not know the party that took Major André, but it is said to have consisted only of militia, who acted in such a manner as does them the highest honour, and proves them to be men of great virtue. They were offered, I am informed, a large sum of money for his release, and as many goods as they would demand, but without any effect. Their conduct gives them a just claim to the thanks of their country, and I also hope they will be otherwise rewarded. As soon as I know their names, I shall take pleasure in transmitting them to Congress. This defection of Arnold was a real blow to President Huntington because his Norwich neighbor was well loved and respected in their hometown. Benedict Arnold, on the other hand, showed no shame in what he had done and wielded propaganda through the newspapers to justify his betrayal. On October 7th Arnold was successful in publishing the following Address "in which he has the effrontery to avow, and attempt by flimsy arguments to justify, his perfidious Treachery." To the INHABITANTS of AMERICA. I SHOULD forfeit even in my own opinion, the place I have so long held in yours, if I could be indifferent to your approbation, and silent on the motives which have induced me to join the Kingarms. A very few words however shall suffice upon a subject so personal, for to the thousands who suffer under the Tyranny of the Usurpers in the revolted provinces as well as to the great multitude, who have long wished for its subversion, this instance of my conduct can want no vindication, and as to that class of men who are criminally protracting the war from sinister views at the expense of the public interest, I prefer their enmity to their applause. I am therefore only concerned in this address to explain myself to such of my countrymen, as want abilities or opportunities to detect the artifices by which they are duped. Having fought by your side when the love of our country animated our arms, shall expect from your justice and candor, what your deceivers with more art and less honestly, will find it inconsistent with their own views to admit. When I quitted domestic happiness for the perils of the field, I conceived the right of my country in danger, and that duty and honour called me to her defence. A redress of grievances was my only object and aim, however I acquiesced in a step which I thought precipitate, the declaration of independence: to justify this measure many plausible reasons were urged, which could no longer exist, when Great Britain with the open arms of a parent offered to embrace us as children, and grant the wishes for redress. And now that her worst enemies are in her own bosom I should change my principles, if I conspired with their designs: yourselves being judges, was the war the less just, because fellow subjects were considered our foes? You have felt the torture in which we raised our arms against a brother, God incline the guilty protractors of these unnatural dissentions, to resign their ambition, and cease from their delusions, in compassion to kindred blood. I anticipate your question, was not the war a defensive one until the French joined in the combination? I answer, that I thought so. You will add was it not afterwards necessary, till the separation of the British empire was compleat? By no means, in contending for the welfare of my country I am free to declare my opinion, that this end attained, all strife should have ceased. I lamented therefore the impolicy, tyranny and injustice, which with a sovereign contempt of the people of America, studiously neglected to take their collective sentiments of the British proposals of peace, and to negociate under a suspension of arms, for an adjustment of differences, as a dangerous sacrifice of the great interests of this country to the partial views of a proud antient and crafty foe. I had my suspicions of some imperfection in our councils, on proposals prior to the Parliamentary Commission of 1778; but having then less to do in the cabinet than the field, (I will not pronounce peremptorily as some may, and perhaps justly, that Congress have veiled them from the public eye:) I continued to be guided in the negligent confidence of a soldier. But the whole world saw, and all America confessed that the overtures of the second commission exceeded our wishes and expectations, and if there was any suspicion of the national liberality, it arose from its excess. Do any believe we were at that time really entangled by an alliance with France, unfortunate decaption! and thus they have been duped, by a virtuous credulity in the incautious moments of intemperate passion to give up their felicity to serve a nation wanting both the will and the power to protect us, and aiming at the destruction both of the mother country and the provinces. In the plainness of common sense, for I pretend to no casuistry, did the pretended treaty with the Court of Versailles, amount to more than an overture to America? Certainly not, because no authority had been given by the people to conclude it, nor to this very hour have they authorized its ratification. The Articles of Confederation remain still unsigned. In the firm persuasion therefore, that the private judgment of any individual citizen of this country is as free from all conventional restraints, since as before the insidious offers of France, I preferred those from Great Britain, thinking it infinitely wiser and safer, to cast my confidence upon her justice and generosity, than to trust a monarchy too feeble to establish your independency, so perilous to her distant dominions; the enemy of the Protestant Faith, and fraudulently avowing an affection for the liberties of mankind, while she holds her native sons in vassalage and chains. I affect no disguise, and therefore frankly declare that in their principles, I had determined to retain my arms and command for an opportunity to surrender them to Great Britain, and in concerting the measures for a purpose in my opinion, as grateful as it would have been beneficial to my country: I was only solicitous to accomplish an event of decisive importance, and to prevent as much as possible in the execution of it, the effusion of blood. With the highest satisfaction I bear testimony to my old fellow soldiers, and citizens, that I find solid ground to rely upon the clemency of our sovereign, and abundant conviction that it is the generous intention of Great Britain, not only to leave the rights and privileges of the colonies unimpaired, together with their perpetual exemption from taxation, but to superadd such further benefits as may consist with the common prosperity of the empire. In short, I sought for much less than the parent country is as willing to grant to her colonies as they can be to receive or enjoy. Some may think I continued in the struggle of these unhappy days too long, and others that I quitted it too soon -- To the first I reply, that I did not see with their eyes, nor perhaps had so favourable a situation to look from, and that to our common master I am willing to stand or fall. In behalf of the candid among the latter, some of whom I believe serve blindly but honestly --- in the bands I have left, I pray God to give them all the lights requisite to their own safety before it is too late, and with respect to that herd of censurers, whose enmity to me originates in their hatred to the principles, by which I am now led to devote my life to the re-union of the British empire, as the best, and only means to dry up the streams of misery that have deluged this country, they may be assured that conscious of the rectitude of my intentions I shall treat their malice and calumnies with contempt and neglect. B. ARNOLD. New York, October 7, 1780." The treason of Benedict Arnold hath been a topic of much conversation, and many of his scandalous transactions are brought to light that were before concealed. Huntington refuted and condemned Arnold’s betrayal making a public spectacle of signing the Presidential Order to erase the traitor’s name from the register of continental officers. This didn't deter Arnold one bit as the British, fresh from victories on all land fronts, were making things miserable for the States on the high seas with the new General making preparations to sail. 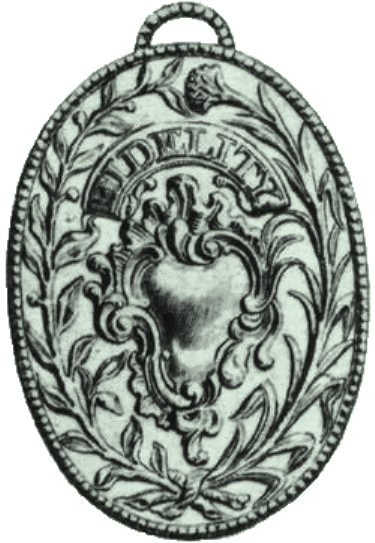 Ordered, That each of them receive annually, out of the public treasury, 200 dollars in specie, or an equivalent in the current money of these States, during life; and that the Board of War procure for each of them a silver medal, on one side of which shall be a shield with this inscription: "Fidelity," and on the other the following motto: "Vincit amor patriæ," and forward them to the commander-in-chief, who is requested to present the same, with a copy of this resolution, and the thanks of Congress for their fidelity, and the eminent service they have rendered their country. Capture of Major André by JOHN PAULDING, DAVID WILLIAMS, and ISAAC VAN WART Repoussé,September 23, 1780, FIDELITY. Field embossed in and wreathed with two branches, one of laurel, the other of palm, united by a ribbon. 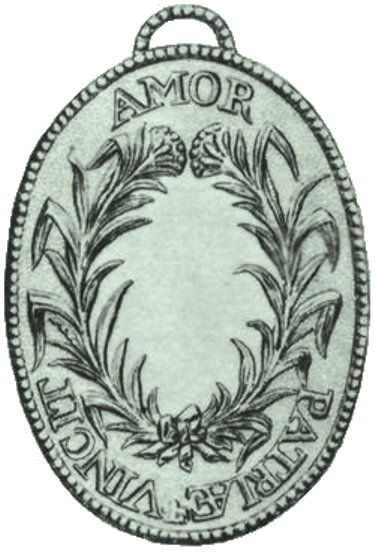 VINCIT AMOR PATRIÆ. (Love of country conquers.) A vacant space, to receive the name of the recipient, between two branches of fleur-de-lis, united by a ribbon. A Repoussé, made by a silversmith. These three militiamen: John Paulding was born in New York in 1759; and died in Westchester County, New York, February 18, 1848; David Williams was born in Tarrytown, October 21, 1754, and died in Broome, Schoharie County, New York, August 2, 1831; Isaac Van Wart was born in New York in 1750, and died in Westchester County, New York, May 23, 1818. captured Major André, of the British Army, September 23, 1780, and refusing his large offers of money, delivered him up to the American commanding officer of the district. Thus the treasonable intentions of General Arnold to surrender West Point to the enemy were frustrated. For this great service to their country they each received the thanks of Congress and a silver medal. An example of the challenges Huntington faced on the seas as President is evidenced in his letter to Caesar Rodney, the President of the Supreme Council of Delaware. The letter is dated November 13th, 1780 only 6 months after General Benjamin Lincoln surrendered his command to British in Charleston, South Carolina. The British, who now effectively controlled the important ports of New York, the Carolinas and Georgia, were making liberal use of papers and clearances that they took from this great southern "prize." In this letter, a beleaguered President Huntington asks Caesar Rodney to support his resolution, adopted at the urging of Minister of France, to deal with the problem of British Spies and their disruption of our trade with France and other allies. I enclose your Excellency Copy of a Letter of the 10 Instant, just received from Governor Jefferson, with the Copy of an intercepted Letter (referred to in the Governors) from General Leslie to Lord Cornwallis; which in some Measure discovers the Designs of the Enemy at the Time they landed in Virginia. persons and properties of the inhabitants....They have, from their situation, borne much of the burthen of the War and have never failed to relieve the distresses of the Army, when properly called upon. are as repugnant to the principles of the cause in which we are engaged as oppressive to the inhabitants and subversive of that order and discipline which must Characterize every well regulated army. 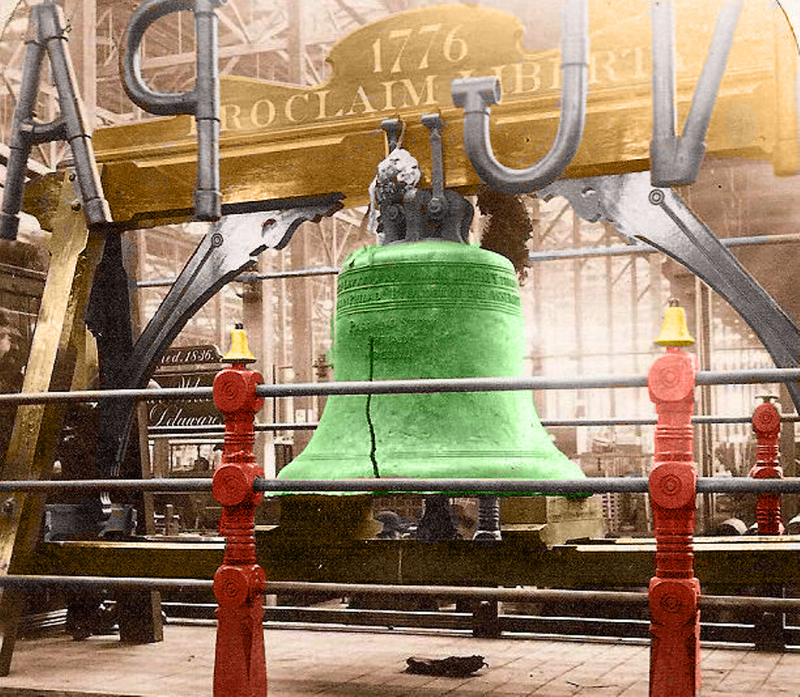 In December, Huntington got a break from his military crisis duties and welcomed General Rochambeau’s aide, Chastellux to Philadelphia. As the President, he hosted a formal banquet for the entire French entourage. The Maryland Delegates, whose state was the lone holdout on the ratification of the Articles of Confederation, were indicating to the President and their French allies that negotiations on the states border disputes were soon to be resolved. Despite Huntington’s political and Washington's military steadfastness, measures continued to worsen for the Continental Army and the disunited States of America. On December 20th British Brigadier General Arnold departed New York City with 1600 men. His plans were to invade Virginia, disrupt the state government while seeking to capture the author of the Declaration of Independence, Governor Thomas Jefferson. As Arnold began the launch of his campaign south, the British advanced northward fresh from their victories in the Carolina’s towards Virginia. Desperation rippled through the ranks even seizing Washington's Pennsylvania troops who mutinied on January 1, 1781 seeking refuge in Staten Island. Washington ordered the New Jersey Continentals to march and position themselves between the mutinying Pennsylvania troops and the British on Staten Island to thwart any possible defections to the enemy. British General Henry Clinton learning of the mutiny immediately dispatched messengers through the lines to the Pennsylvania Continentals to insure them they would be welcomed in the British ranks. The mutineers, realizing they would have to fight their way through the New Jersey Militia to defect, seized the messengers and turned them over to President Huntington. The messengers were tried and hung as British spies by the Continental Congress ending the mutiny. Another embarkation has taken place at New York supposed to consist of two thousand five Hundred land forces, whose destination is not yet known the fleet fell down to the Hook on Wednesday last. Our Conjecture is that they are destined to the Southward, and indeed all the Enemy's political & military maneuvers seem to indicate their Intention of making a Vigorous effort against the Southern States, this Winter. We are Sorry to inform yr. Excellency that we receive very little Authentic Intelligence of the Steps which are taking to counteract those vigorous operations, that we are in a great measure uninformed of the progress that has been made in raising the new army, and on what terms, of what has been, and will be, done in establishing Magazines for its Support, and above all, of the measures perusing to cancel the old money and give an effectual Support to the new, by providing for its punctual and final redemption with Specie. This is a crisis at which we conceive a most assiduous application to these great objects to be necessary, and (next to the completion of the Confederacy which is perhaps the Basis of the whole) of the first importance to America therefore highly importing us to know, as the measures of so large a state as ours cannot but have considerable effects on the other states in the Union. Dr. Sir: I have the pleasure to inform your Excellency that the measures concerted for quelling the mutiny in the Jersey line were this morning carried into full execution. The mutineers were unexpectedly surrounded and awed into an unconditional surrender with little hesitation and no resistance. Two of the principal actors were executed on the spot, the rest pardoned. The spirit of mutiny seems now to have completely subsided and to have given place to a genuine repentance. This was very far from being the case previous to this step, notwithstanding the apparent submission which the assurances of redress had produced; they still continued insolent and refractory and disobedient to the commands of their officers. A general pardon was promised by Colonel Dayton, on condition of an immediate and full return to duty. This condition was not performed on the part of the mutineers and of course they were not entitled to the benefit of the promise; besides which the existence of the Army called for an example. President Huntington and Congress understood the complaints of the soldiers but without the ability to tax the treasury was empty and still battling currency inflation resulting in inadequate provisions and delinquent military salaries. Huntington’s only recourse was to step up congressional appeals to the states for better maintenance of the army. General Morgan to General Greene. Camp, near Cain Creek,January 19, 1781.To: General Greene. Sir: The troops I have the honour to command have been so fortunate as to obtain a complete victory over a detachment from the British army, commanded by Lieutenant-Colonel Tarleton. The action happened on the 17th instant, about sunrise, at the Cowpens. It perhaps would be well to remark, for the honour of the American arms, that although the progress of this corps was marked with burning and devastation, and although they waged the most cruel warfare, not a man was killed, wounded, or even insulted, after he surrendered. Had not the Britons during this contest received so many lessons of humanity, I should natter myself that this might teach them a little. But I fear they are incorrigible. To give you a just idea of our operation, it will be necessary to inform you, that on the 14th instant, having received certain intelligence that Lord Cornwallis and Lieutenant-Colonel Tarleton were both in motion, and that their movements clearly indicated their intentions of dislodging me, I abandoned my encampment on Grindall's Ford on the Pacolet, and on the 16th, in the evening, took possession of a post, about seven miles from the Cherokee Ford, on Broad river. My former position subjected me at once to the operations of Cornwallis and Tarleton, and in case of a defeat, my retreat might have easily been cut off. My situation at the Cowpens enabled me to improve any advantages I might gain, and to provide better for my own security should I be unfortunate. These reasons induced me to take this post, at the risk of its wearing the face of a retreat. I received regular intelligence of the enemy's movements from the time they were first in motion. On the evening of the 16th instant they took possession of the ground I had removed from in the morning, distant from the scene of action about twelve miles. An hour before daylight, one of my scouts returned and informed me that Lieutenant-Colonel Tarleton had advanced within five miles of our camp. On this information, I hastened to form as good a disposition as circumstances would admit, and from the alacrity of the troops, we were soon prepared to receive them. The light infantry, commanded by Lieutenant-Colonel Howard, and the Virginia Militia, under the command of Major Triplett, were formed on a rising ground, and extended a line in front. The third regiment of dragoons, under Lieutenant-Colonel Washington, were posted at such a distance in their rear as not to be subjected to the line of fire directed at them, and to be so near as to be able to charge the enemy should they be broken. The volunteers of North Carolina, South Carolina, and Georgia, under the command of the brave and valuable Colonel Pickens, were situated to guard the flanks. Major McDowell, of the North Carolina Volunteers, was posted on the right flank in front of the line, one hundred and fifty yards; and Major Cunningham, of the Georgia Volunteers, on the left, at the same distance in front. Colonels Brannon and Thomas, of the South Carolinians, were posted on the right of Major McDowell, and Colonels Hays and McCall, of the same corps, on the left of Major Cunningham. Captains Tate and Buchanan, with the Augusta Riflemen, to support the right of the line. The enemy drew up in single line of battle, four hundred yards in front of our advanced corps. The first battalion of the 71st regiment was opposed to our right, the 7th regiment to our left, the infantry of the legion to our centre, the light companies on their flank. In front moved two pieces of artillery. Lieutenant-Colonel Tarleton, with his cavalry, was posted in the rear of his line. The disposition of battle being thus formed, small parties of riflemen were detached to skirmish with the enemy, upon which their whole line moved on with the greatest impetuosity, shouting as they advanced. McDowell and Cunningham gave them a heavy and galling fire, and retreated to the regiments intended for their support. The whole of Colonel Pickens' command then kept up a fire by regiments, retreating agreeably to their orders. When the enemy advanced to our line, they received a well-directed and incessant fire; but their numbers being superior to ours, they gained our flanks, which obliged us to change our position. We retired in good order about fifty paces, formed, advanced on the enemy, and gave them a fortunate volley, which threw them into disorder. Lieutenant-Colonel Howard, observing this, gave orders for the line to charge bayonets, which was done with such address that they fled with the utmost precipitation, leaving their field pieces in our possession. We pushed our advantages so effectually, that they never had an opportunity of rallying, had their intentions been ever so good. Lieutenant-Colonel Washington, having been informed that Tarleton was cutting down our riflemen on the left, pushed forward, and charged them with such firmness, that, instead of attempting to recover the fate of the day, which one would have expected from an officer of his splendid character, they broke and fled. The enemy's whole force were now bent solely in providing for their safety in flight—the list of their killed, wounded, and prisoners, will inform you with what effect Tarleton, with the small remains of his cavalry, and a few scattering infantry he had mounted on his waggon horses, made their escape. He was pursued twenty-four miles, but owing to our having taken a wrong trail at first, we never could overtake him. As I was obliged to move off the field of action in the morning, to secure the prisoners, I cannot be so accurate as to the killed and wounded as I could wish. From the reports of an officer whom I sent to view the ground, there were one hundred non-commissioned officers and privates, and ten commissioned officers, killed, and two hundred rank and file wounded. We have now in our possession five hundred and two non-commissioned officers and privates prisoners, independent of the wounded, and the militia are taking up stragglers continually. Twenty-nine commissioned officers have fallen into our hands. Their rank you will see by an enclosed list. The officers I have paroled, the privates I am conveying by the safest route to Salisbury. Two standards, two field pieces, thirty-five waggons, a travelling forge, and all their music are ours. Their baggage, which was immense, they have in a great measure destroyed. Our loss is inconsiderable, which the enclosed return will evince. I have not been able to ascertain Colonel Pickens' loss, but know it to be very small. From our force being composed of such a variety of corps, a wrong judgment may be formed of our numbers. We fought only eight hundred men, two-thirds of which were militia. The British, with their baggage guard, were not less than one thousand one hundred and fifty, and these veteran troops. Their own officers confess that they fought one thousand and thirty-seven. Such was the inferiority of our numbers, that our success must be attributed to the justice of our cause and the bravery of our troops. My wishes would induce me to mention the name of every sentinel in the corps I have the honour to command. In justice to the bravery and good conduct of the officers, I have taken the liberty to enclose you a list of their names, from a conviction that you will be pleased to introduce such characters to the world. Major Giles, my aid, and Captain Brookes, my brigade-major, deserve and have my thanks for their assistance and behaviour on this occasion. The Baron de Glasbuch, who accompanies Major Giles with these despatches, served with me in the action as a volunteer, and behaved in such a manner as merits your attention. I am, dear Sir, your obedient servant,Daniel Morgan. P.S. Our loss was very inconsiderable, not having more than twelve killed and about sixty wounded. The enemy had ten commissioned officers and upwards of one hundred rank and file killed, two hundred rank and file wounded, and twenty-seven officers and more than five hundred privates which fell into our hands, with two pieces of artillery, two Standards, eight hundred stand of arms, one travelling forge, thirty-five waggons, ten negroes, and upwards of one hundred dragoon horses. Although our success was complete, we fought only eight hundred men, and were opposed by upwards of one thousand British troops. Congress thus began discussing how best to honor General Morgan. 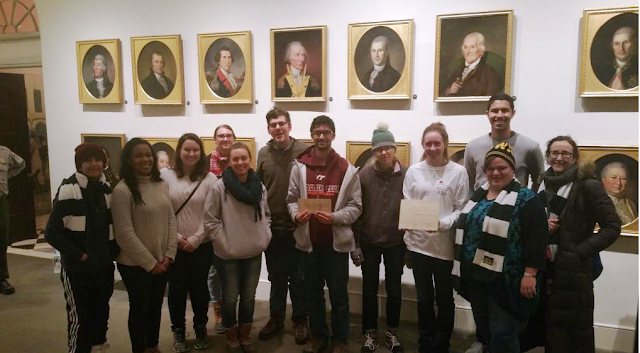 During this period Congress began to make headway on reorganizing itself in anticipation of Maryland’s ratification of the Articles of Confederation. A debate on a resolution establishing a department of foreign affairs headed by a secretary charged with managing all diplomatic activities was about to be passed. In early February congress resolved to appoint executive officers to direct the war, navy, and treasury departments. On February 19th, in an important resolution that would result in the stabilization of the post-war economy, Robert Morris was appointed Superintendent of Finance. Morris’ powers were analogous to that of Secretary of the Treasury. Morris’ appointment was a boost of confidence for the states and the national government. Treasury resources were stabilized and began to cash flow enough to enable Washington and his Generals to continue waging what many Americans had believed to be a lost war for freedom only six months earlier. Your Excellency will receive herewith enclosed an Act of Congress of the 6 Instant, adopting the report of a Committee; together with Copies of the several Papers referred to in the report. I am directed to transmit Copies of this report and the several Papers there in mentioned to the Legislatures of the several States, (1) that they may all be informed of the Desires & Endeavours of Congress on so important a Subject, and those particular States which have Claims to the Western Territory, & the State of Maryland may adopt the Measures recommended by Congress in Order to obtain a final ratification of the Articles of Confederation. 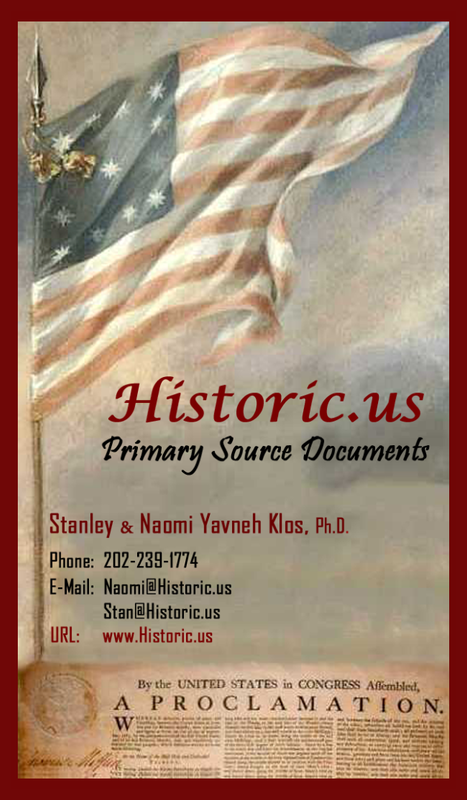 Articles of Confederation and perpetual Union between the states of New Hampshire, Massachusetts-bay Rhode Island and Providence Plantations, Connecticut, New York, New Jersey, Pennsylvania, Delaware, Maryland, Virginia, North Carolina, South Carolina and Georgia." By virtue of this ratification, the ever fluid Continental Congress ceased to exist. On March 2nd "The United States in Congress Assembled" was placed at the head of each page of the Official Journal of Congress. The United States of America’s perpetual union, which was conceived on July 2, 1776, proclaimed on the 4th, re-formulated on November 15, 1777 had finally been born with the Articles of Confederation’s ratification under the watch of President Samuel Huntington. IN pursuance of an Act of the Legislature of Maryland, entitled, 'An Act to empow­er the Delegates of the State in Congress to subscriber and ratify the Articles of Confederation,' the Delegates of the said State, on Thursday last, at twelve o'clock, signed and ratified the Articles of Confederation; by which act the Confederation of THE UNITED STATES OF AMERICA was completed, each and every of the Thirteen States, from New Hampshire to George, both included, having adopted and confirmed and by their Delegates in Congress ratified the same. This happy even was immediately announced to the public by the discharge of the artillery on land, and the cannon of the shipping in the river Delaware. At two o]clock his Excellency the President of Congress received on this occasion the congratulations of the Hon. the Minister Plenipotentiary of France, and of the Legislative and Executive Bodies of this State, of the Civil and Military Officers, sundry strangers of distinction in town, and of many of the principal inhabitants. The evening was closed by an elegant exhibition of fireworks. The Ariel frigate, commanded by the gallant John Paul Jones, fired a feu de joye, and was beautifully decorated with a variety of streamers in the day, and ornamented with a brilliant appearance of lights in the night. Thus will the first of March, 1781, be a day memorable in the annals of America, for the final ratification of the Confederation and perpetual Union of the Thirteen States of America --- A Union, begun by necessity, cemented by oppression and common danger, and now finally consolidated into a perpetual confederacy of these new and rising States: And thus the United States of America, having, amidst the calamities of a destructive war, established a solid foundation of greatness, are growing up into consequence among the nations, while their haughty enemy, Britain, with all her boasted wealth and grandeur, instead of bringing them to her feet and reducing them to unconditional submission, finds her hopes blasted, her power crumbling to pieces, and the empire which, with overbearing insolence and brutality she exercised on the ocean, divided among her insulted neighbors. By the Act of Congress herewith enclosed your Excellency will be informed that the Articles of Confederation & perpetual Union between the thirteen United States are formally & finally ratified by all the States. We are happy to congratulate our Constituents on this important Event, desired by our Friends but dreaded by our Enemies.